The camera spends a lot of time spinning in “The Marvelous Mrs. Maisel.” It spins through elegant department stores and down wide boulevards; it reels from room to room of a gorgeous apartment and between the wobbly tables of a basement club. It swoops and swirls, allowing the audience to drink in every rich detail, to feel as dizzy and delirious as the people who live in this world on their very best, or very worst, day. It’s a champagne feeling. It’s as if the camera has found a way to celebrate its presence in these rooms, and it had the good grace to invite you along for the ride. That’s an effective approach for a story with delights so obvious—so effective, in fact, that it sometimes disguises the thing that makes this series so special: Its pleasures are pure, but so is its pain. That’s also the secret of comedy, according to one Miriam “Midge” Maisel (Rachel Brosnahan). When we last left the Mad Divorcée of the Upper West Side, she was behind a microphone, arms raised in triumph, and it looked like she was headed for success and that she might not end up a divorcée after all. But things are rarely so simple, even when you’re beautiful and rich (and, of course, fictional). As season two begins, Midge and manager Susie (the terrific Alex Borstein) are simultaneously dealing with the fallout from Midge’s takedown of Sophie Lennon (Jane Lynch) and flying high from a triumphant set unluckily witnessed by Joel (Michael Zegen), Mr. Maisel himself. They’re struggling to balance their joint ambitions with their personal struggles, and in Midge’s case, learning that leading a double life comes at a cost. The secrets pile up, but hey, at least the jokes keep coming. These scenes are so quietly thrilling, so charged, that it can sometimes feel as though one’s experience of watching the show mirrors Midge’s day-to-day. You’re just bumping along, yanked this way and that by the family (Marin Hinkle and Tony Shalhoub), the job (working phones at B. Altman), the ex, the friends, and very rarely, the kids—still mostly a non-entity, a fact acknowledged by the show in a rare piece of meta-humor that doesn’t diminish the strangeness of such a blatant blindspot. And suddenly it’s showtime, and everything falls into place. The pulse quickens. You lean forward in your seat. You’re riveted, your focus unshakeable, and suddenly it all makes perfect sense. Then the light goes out, the applause slows to a trickle, and it’s back to bumping along. The in-betweens can be fascinating, but you live for those moments in the spotlight, and it’s easy to wind up feeling a little bit impatient for the next one. Luckily, the in-betweens can be pretty great, too. That’s especially true when “Mrs. Maisel,” an effective-as-hell comedy, stops going for laughs and lets that melancholic streak shine through. A cast this good finds plentiful opportunities for sad, subtle work, but Sherman-Palladino and her writers room (including Daniel Palladino) seem to have been particularly interested in Susie, and in giving Borstein, a standout in season one, even more to do. The results speak for themselves. If Brosnahan’s performance offers most of the show’s thrills, and sets its tempo, it’s Borstein who fills its silences and does the most to ground it in something immediate and painful. When things go well for Susie and Midge, both Borstein and Brosnahan project joy, pride, or triumph, but Borstein draws out other elements of Susie’s experience: anxiety, exhaustion, incredulity, and every so often, palpable relief. Midge does this because she loves it. Susie loves it too, but she also needs, desperately, to get paid. Susie and Borstein exercise a quiet pull on the series—flashier stories, louder performers, and bigger names (like Zachary Levi, who arrives mid-season) show up, but good though some of them are, they can’t compete with her acerbic, gloomy specificity. But while much of that is due to Borstein’s performance and the great writing with which she’s working, it’s likely that some of the aforementioned quiet pull results from the contrast between Susie’s more intimate storylines and the sweeping, swooning, crayola-colored stories found elsewhere. “Mrs. Maisel” can’t just go to Paris, it has to be the most Parisian (a chapter that, for fans of Sherman-Palladino’s “Gilmore Girls,” will likely bring to mind one of that show’s most frustrating storylines.) 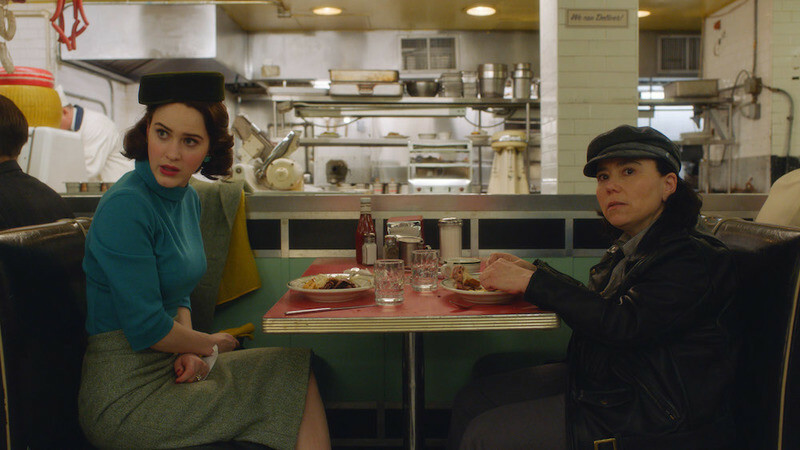 The roots of these plotlines are always honest and human, but “Maisel’s” tendency to go just a few steps further makes it occasionally exhausting, and puts it at risk of sometimes sacrificing the meat of the story for the marvelousness. And yet—who cares? All the wonders of “The Marvelous Mrs. Maisel’s” first season remain intact: the dazzling production and costume design, art direction, and music supervision; the dialogue that fizzes like Prosecco and performances that linger in the air like cigarette smoke in a windowless club. And the jokes, my god, the jokes—bitter and bright as a stiff gin cocktail, sharp-toothed and smiling with a matter-of-fact stare. It’s great that they’re funny. It wouldn’t work if they weren’t. But on “The Marvelous Mrs. Maisel,” the jokes all come from somewhere, and that’s what makes it sing.